BULGARIA | Ignoring the past is condemning the future! We don’t like numbers. Numbers, however big or small, say nothing, when it comes to human life. If you imagine a person – with all their connections with family and friends, with all the things they have done in their lives (raised a child, built a house, invented something, or planted a tree), with all the personal drama they’ve been through in their life… It’s cynical and offensive to reduce this to numbers. However, we know some people need the numbers in order to understand the facts (we may be bad at math, but we’ve read the Little Prince). So, that’s why we present this text, explaining more or less the victims of Bulgaria in World War II. Please, when you see numbers – try to imagine every one of those lives. It is not possible of course, but at least try. Otherwise, it just doesn’t make sense. Bulgaria managed to keep neutrality in World War II until March 1941, when the country allied with the Axis Powers (Germany, Italy and Japan). Although it managed to keep military passivity for a while, it was forced by Germany to declare war on the United Kingdom and the United States in December 1941. The Bulgarian army did not participate actively on the Western German front, or in the invasion against the Soviet Union, however it gave its victims on the battlefield. Although managing to save its Jewish population from deportation, the Bulgarian authorities introduced a lot of fascist-like laws and measures, which also caused victims. Along with that parts of the local population started organized resistance against the authorities in the so-called partisan movement. The government answered with repression. The conflict could be qualified as a civil war, which also took thousands of victims. In September 1944, the Soviet Union unexpectedly declared war on Bulgaria, just as the latter was about to withdraw from the Axis and declare war on Germany. Four days later the Soviet army entered Bulgaria and stayed there until 1947. The military participation of the Bulgarian army in the World War II on the Axis side mainly consists of gaining parts of Greece and Yugoslavia. The Bulgarians occupied territory between the Struma River and a line of demarcation running through Alexandroupoli and Svilengrad west of Maritsa. It is reported that those operations resulted in 2 000 military casualties. As part of the Allies three Bulgarian armies (some 455,000 strong in total) entered Yugoslavia in September 1944 and moved from Sofia to Niš and Skopje with the strategic task of blocking the German forces withdrawing from Greece. The Bulgarian First Army continued to Hungary, driving off the Germans and entering Austria in April 1945. 10 124 military deaths were reported from Bulgarian side. The complicated foreign situation reflects the internal policy in Bulgaria. A newly-formed government takes the power in 1940 and its ruling could be categorized as anti-democratic. It is determined by the union with fascist Germany and the willingness of the government to strengthen the authoritarian regime. In 1940 a Law for civic mobilization is voted which limits the civic rights and liberties. The freedom of the speech and the right for gathering in associations are strictly limited. Later on new measures are introduced according to which almost every crime is to be punished with a death sentence. Another law establishes an organization for the Bulgarian youth called Brannik which shares a lot of common characteristics with the fascist “Hitler’s Youth”. At that time the Law for protection of the nation is also passed, which oppresses the Jewish community. In the registration of the population of Bulgaria in 1926 the Jewish population are on third place among the minorities with the number of 46 558 or 0.85 % of the population. The Jewish population in concentrated in towns due to their main economic activity – trade or crafts. The total number of Jews in Bulgaria decreases due to migration. While during the period 1918-1938 an average of 133 people per year used to emigrate, during the period 1938-1945 the number reaches 460 people. The main reason is the Law for the Protection of the nation (23.01.1941). This law along with other political measures introduced a number of oppression practices. All municipalities where there were Jews were given the task to organize the dislocation of the Jews. This law not only changed the place of residence of this community but also their property was confiscated and they were prohibited of economic and professional activity. The Jews were not allowed to take public or state duties, to be elected or to pose or hire property. Exclusive taxes were introduced over their property. The Jewish population was obliged to wear a David star badge; movement restrictions and curfew were introduced. It is suggested that many Jews being “guilty” for not following the rules were sent to work camps. Bulgarian intellectuals, politicians, Orthodox Church opposed the law and the follow-up measures. Due to the role of the politician Dimitar Peshev, Bulgarian Church officials and ordinary citizens Bulgaria managed to save its Jewish population (48 000 people), that was prepared for deportation. However, 11 343 Jews from the regions of Aegean Thrace and Eastern Macedonia were deported to the death camps in Poland. These territories were considered part of Bulgaria during the war and the deportation was supported by the Bulgarian governmental structures. It is debatable whether Bulgaria should take the responsibility for those human losses, as they were not Bulgarian citizens. The bombing of Bulgaria was conducted by the US and the UK air forces and started in November 1943. With the first air raids of the capital Sofia (November 14) 47 buildings and structures were destroyed, 59 people were killed (both military and civilians) and over 128 injured. The bombing was reintroduced on and off by April 1943. The most severe bombing of Sofia ever occurred on March 30, 1944. Some 370 American heavy bombers flew upon Sofia destroying 3575 buildings. The casualties were relatively modest due to the preliminarily evacuation of the civilians. The target of the bombing were neither military installations, nor armed forces, but the very historical downtown of the city of Sofia. Not only Sofia was bombed – air raids were conducted over bigger towns like Kjustendil, Plovdiv, Veliko Turnovo, Mezdra, Karlovo, Rousse, Lom, but also over smaller towns and ever mountain villages. Skopje and Nis, which were considered under the rule of Bulgaria during the war, were bombed severely. As a result of the bombing 1 243 people are reported dead and 1 355 injured. 12 564 buildings were damaged, out of which 2 670 were completely destroyed. As a result of World War II Bulgaria lost 25 000 people, which made around 0.38% of the population at that time. Compared to other countries participating in the war, this could be perceived as minimum loss. And while comparing numbers might be possible, this is not the case of comparing human lives. Because if you imagine a person – with all their connections with family and friends, with all the things they have done in their lives (raised a child, built a house, invented something, or planted a tree), with all the personal drama they’ve been through in their life… It’s cynical and offensive to reduce this to numbers. His name is Yordan Nikolov Krachanski. He is now eighty-four years old and lives in the town of Sapareva Banya where he was born. At the time the World War Two started, his father was a builder and his mother worked on the cornfields. He’s been an apprentice for six years, starting at the age of 11. He was 17 when the war started. He escaped to join the army. During the training, it turned out that he was a very “furious, wild soldier”, so they gave him a machine gun to fight with on the front. The first time his regiment was called to join the battlefield no one believed that they were going to fight for real, they though it was part of the training and they were there just to see how it looks like. Without knowing, they’ve entered the German territory. Three Bulgarian soldiers told them that, so they quickly stepped back. They climbed the mountain, but then the Germans started shooting them. Thirty five people died for an hour. The Germans wanted to captivate them. The ones with machine guns were gathered and allocated, so they can fight back. The Germans were about to enter the Bulgarian territory when Yordan and a friend of his managed to shoot some of the Germans down. In the meanwhile an Albanian soldier tried to shoot Yordan down. He tried for seven times, hurt his arm and shot his helmet away. So Yordan had to hide in the trench they’ve digged. At the end he managed to shoot the Albanian down, but remembers that while the Albanian soldier was shooting at him, he killed a fellow soldier, also from Sapareva banya. After the German army was pushed away, Yordan’s regiment went to Sofia. Yordan was approved for aviator, but he wasn’t educated enough for that service. As he was too young (17), he was not allowed on the front again. Asked whether there were Roma people in his regiment, Yordan remembers of a man called Metko, who later on moved to another town. They’ve talked then among each other, they talk now. Bulgarian and Gypsies – we’ve all been so poor and miserable, that’s why we stick together and respect each other, Yordan says. Yordan hasn’t counted how many people were killed from his regiment, but he’s sure they were more than hundred. History is a circle of events that are linked together, they say. As an example of the interesting paths of history we give the story of one man who saved the life of many people. In XV century many Jews were forced to leave Spain and found their new home in theOttoman Empire. Some centuries later maybe some of their inheritors/grandchildren were saved from the Holocaust with the help of one Spanish diplomat. His name is Julio Palencia Tubau (1884 – 1952) and he was a Spanish ambassador in Sofia during the Second World War. In this period a secret agreement with Nazi Germany was signed concerning 6000 Jews from the old territories of Bulgaria to be deported to death camps in Poland. Of course all the diplomats working inSofiaat this time had a clear view about the situation. Thus on 16 of March 1943, the Spanish ambassador Julio Palencia had a meeting with the Prime Minister Bogdan Filov, who confirmed to him that in April the Bulgarian Jews will be deported from the country. Palencia immediately sent a message to the Foreign Minister of Spain, Francisco Gomez, to inform him that the Spanish Jews in Bulgaria (whose number is around 160 people) will be deported. Francisco Gomez didn’t answer his message and Palencia sent another one asking for an advice how to save the Spanish Jews that lived in Bulgaria. On May 15, 1943 he addressed the Minister again, asking him to allow repatriation of all Spanish Jews from Bulgarian territories who were about 300 people. 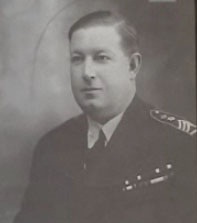 Due to the lack of any answer to all his letters Palencia met the Hitler’s representative in Sofia, who was responsible for the deportation – Adolf Heinz Beckerle, and told him that Spain is willing to repatriate all the Spanish Jews from Bulgaria back in Spain. He also insisted on releasing the arrested Jews. In vain. The lack of answers and the refusals did not stop Palencia not only to give visas to a lot of Jews but even to adopt two Jewish children. He risked his carrier in the name of humanity. Beckerle decided to stop Palencia’s intentions by sending a secret message to Berlin explaining that the Spanish ambassador is trying to save his friends by repatriating them to Spain. As a result Palencia was declared persona non grata in Bulgaria and an enemy of the Germans. He was deported from Bulgaria in the summer of 1943. When he returned to Madrid Palencia was reprimanded for his work and till the end of his life he worked as an ordinary clerk. The Raoul Wallenberg Foundation collected a great number of documents that proved that Palensia saved more then 600 Bulgarian and Spanish Jews. Since 2010 on the building of the Spanish embassy inSofiathere is a plaque in the memory of the diplomat and his braveness in the name of humanity. The story of the great granddaughter: Destiny! My great grandfather’s name is Rusi Jeliazkov Yanev. He is born in the village of Vulchi Izvor, in the district of Yambol, on 9th February 1925. In 1943 he was 18 years old, young, unbounded, with short temper and very energetic. He has participated in the youth revolutionary and labor movement in the village of Voden. His parents have sent him to study a craft (shoemaking) and there he has met lots of youth, sharing the same ideas at that time. He has been a member of the Labor Youth Council and lead a political fight. They organized meetings together with the members of the Labor and Village Youth, disseminating brochures and leaflets in the near villages. Their activities were not a secret for the police and after being chased he went to jail. Just engaged and already a prisoner. His wife (departed) Sultana Stoilova Yaneva, remained neither bachelor girl, nor a married woman as the brides. She was beautiful, but skinny girl, due to half-starvation. Very often she was sick, but no medical checkup was done, because they had no money. The medical treatment she was always receiving was the so called “home treatment”. My great grandmother was working from early morning to late evenings at the tobacco-field. The food was poor, almost missing. Knead dough from corn flour and this was their food. They were gathering tobacco for the rich people, in that time called gaffers. They lived in an adobe house, the roof was half covered with Turkish tilling, half with straw. They were hoping for better times to buy more tills, but such times never came. The roof was still uncovered. When they got married, the ceremony was in the church with the parents from both sides and few of their relatives. It was a time of poorness and struggles, but the gaffers gave them something in order to prepare the food for the wedding and afterwards and then they reduced it from the payments. There was no music, no rich and delicious table. Rakia and wine were served from own production and it was not enough, hardly was enough for the engagement, the wedding and the “sweet rakia”. The parents of the newly-weds had small vineyard and at the time of the year there was not so much fruits. 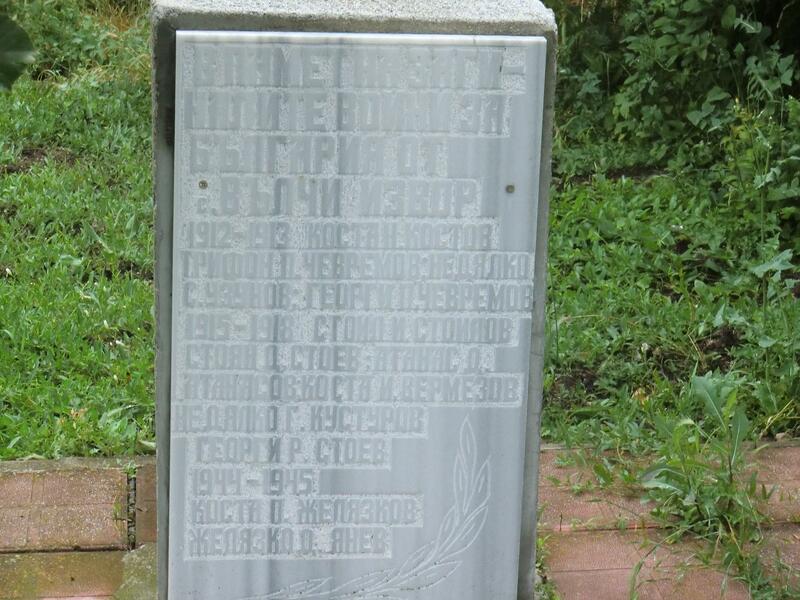 Monument with the names of the people who died during the First and the Second World War in the village of Vulchi Izvor. The information on the monument is gathered by Rusi Jeliazkov Yanev. As newly-weds they gave my great grandparents a single room, which used to be a hen-house before. The floor was made from dung and straw, the bed is mat, above covered and rapped from rags and for blanket they had woolen wrap. They were happy and grateful for that. Ah springtime, springtime, if it was for eternity. The police engaged my grandmother to investigate her too, they were questioning her, but she is ordinary girl and did not have a stand on the political situation. The agony after her beloved, the pain without information about him (at the time he was in the jail of Burgas) regretting her soul with dark thoughts and doubts if he still alive. Her family wondered whether to look for a new husband for her or to wait for more news about grandfather Rusi. They both (grandfather and grandmother) took huge suffering. Grandfather was in jail and suffered from lot of physical torture and pain. He was wrapped on a chair, bitten with heavy metals, pulled out nail-fingers and cut fresh. Still you can see the gash on his back. And for those sores in his soul I won’t mention. And even today once children start singing on the TV, he starts crying. He has an incredible soul and has written the history of our family and our village. This story I am writing is told by his daughter, my grandmother – Rada Ruseva Genova, born in 11.08.1945. Later, after the changes in 09.09.1944, my grandfather moved to live in Sofia. He entered in the National Government School for Policemen. He graduated and became a teacher in the same school. He retired on a pension with rank “Colonel”. 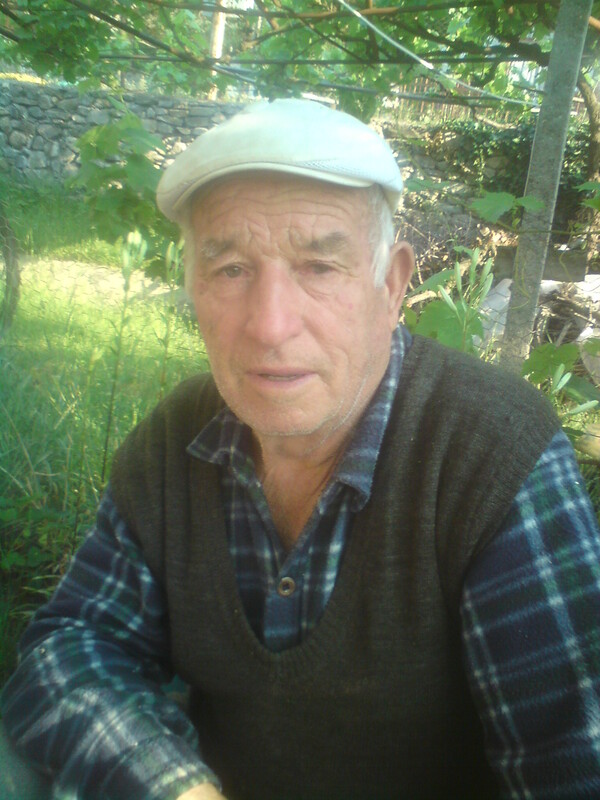 At present day (25.06.2011) he lives in the neighborhood “Drujba” in Sofia and celebrates the happiness of his great grand children. He loves very much to read books and write down memories, which he is proud of, but not for those hard years, but the ones on the way up, because this was his cause. We have already described the casualties and the effects of the intense aid raids over Bulgaria and particularly Sofia during World War 2. Nowadays Sofia does not bear physical signs of the bombings and many of the people going down the streets, once devastated, do not have an idea of the great destruction that was in place under their feet. 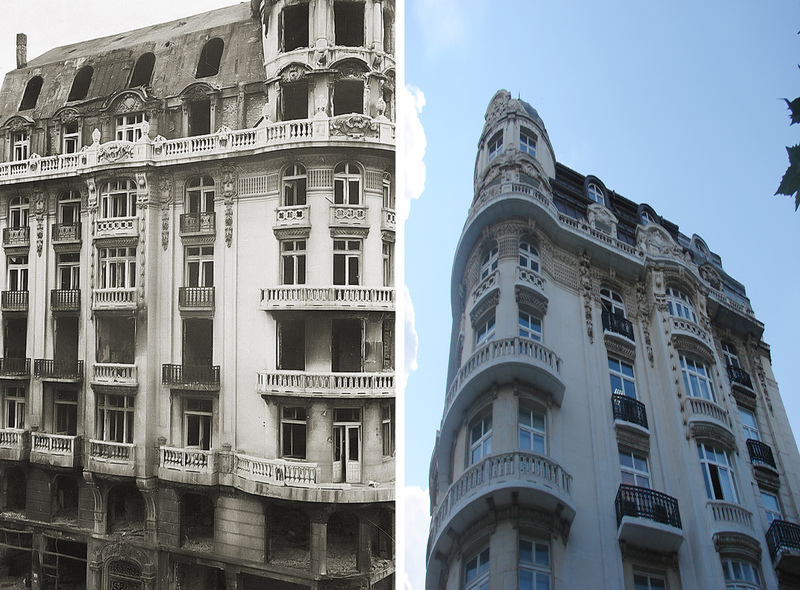 We are offering comparison photo story of some of the Sofia places that were greatly damaged by the air raids. The old photos are taken from the website “Изгубената България” – http://www.lostbulgaria.com. The new oneс are done in July 2011 by the History in Action club of the Pakiv European Network. There is a song from the 80’s Bulgarian pop music, the name of which is hardly remembered, but the chorus represents the university student’s dream of a landlady which brings Viennese croissant and coffee early in the morning. I’ve had a lot of landladies, but one of them was just like the one from the song, the name of which nobody remembers. She never missed to bring warm breakfast in the morning and even warmer wish for a nice day. Aunt Jani, that’s how I called her. She grew up in a family with 11 brothers and sisters and this was my explanation why she was always sharing her breakfast with me. Looking back, I feel embarrassed that at the time I was trying to find a logical explanation for her humanity. As there is no logic in inhumane deeds – same should be applied for human deeds… but let’s not go into details. Although it is exactly a detail that stays vivid in my memory. It is a about this mellow sweet which I never liked – baklava. Since I was a child I was never able to eat it. Every time something was preventing me from swallowing it. Same happened with the piece that my dear landlady brought to me one morning along with a memory for her little brother. Old people have the talent to share memories. Sometimes they even get a bit annoying, but I am grateful to my aunt Jani for sharing this story with me! She saved me the horror she’s been through in the story. She didn’t say the exact date, but this is not important. Bombs started falling over Sofia. She was at home with her mother and the youngest of her brothers, which was then 5 years ago. Their mother grabbed them and rushed out. They were barefoot. She did not remember how long have they been running, but they reached the Sugar Factory neighborhood. They saw an open door in one of the houses and they went in. They entered a room and sat around the table. And on the table there was a dish with baklava. They were silent the whole time while the bombs were falling… they remained silent and stared at the baklava. At one point the little brother couldn’t resist and reached for a piece of the sweet. But, as aunt Jani says, “Mom stopped him. She said the people will be back and the dish has to be full. We are not thieves!”. And this is the story. The American and the British airplanes bombed a lot of common buildings, temples and people’s homes. But they couldn’t bomb their souls! Aunt Jani is in a better place for long time now. I miss her. Sometimes I enter a sweetshop, look at the baklava… and I have strengths to move on! I share this story so that you can share it somebody else… somebody might really need this story about the bombing over Sofia and a dish with baklava. P.S. : I don’t know if this detail is important, but the name of the song about the landlady and the croissant is “Fortune”!